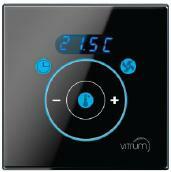 Vitrum is 100% designed and made in Italy switch. 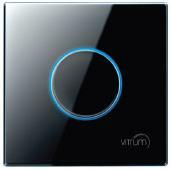 Vitrum brings innovation to your home with sophisticated design and latest technology. Users can now control not only lights, but also other electronic home appliances with our intuitive iPad application, downloadable for free. Think of three simple and harmonious things: a circle of light, a glass surface, your hand. A circle and a block: two simple and regular shapes. A smooth surface, with elegant and personal lines. A bright, concave spot, which naturally catches your eye and attracts your hand. That’s how Vitrum turns routine into magic. The only sculpted glass in the world. A revolutionary concept and incredible details. 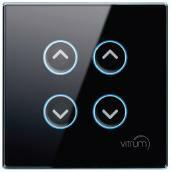 Vitrum turns routine into a new experience in style. Different shapes coexist on a homogeneous surface and provide a high level sensory impact: no click, no movement. The absence of sharp edges makes the plate even more precious. The use of chrome plating integrates the visual and physical qualities of the glass to obtain a balanced and comprehensive unit. The most advanced and intuitive experience. Shape, light and sound merge into unparalleled ergonomics. Vitrum involves sight, touch, and hearing. Vitrum’s buttons are surrounded by a circle of light that makes it easy to find in the dark, while its inviting concave buttons lead your fingers to the controls on the plate. Every time your fingers touch the button, a sound informs the user about the status of the system and the outcome of the command. One to four buttons for all lighting functions: on, off, dimming, scenarios. Three modules EU standard configurations, with up to six buttons, are also available on a wider plate. Not available for six buttons.